In this final book of the K-PAX series, Dr. Gene Brewer is approached by visitors from the planet Bullock, who demand that he deliver an ultimatum to the United Nations: Homo sapiens must end the killing of other humans as well as all other animal species living on Earth. Failure to meet this demand will result in the immediate extinction of the human race. Dr. B is amazed to discover that U.S.… Government officials, including the President, have been expecting such visitors (who, though not corporeal, behave like a colony of ants), and are fully prepared to acquiesce to these demands. The problem is that the rest of the world must be convinced that the Bullocks are capable of, and willing to, eliminate human beings from the face of the Earth. Sometimes funny, always sympathetic, Dr. Brewer has a number of encounters with the Bullocks, in which he experiences undreamed of travels around the galaxy, and to his own past and beyond. For their part, the aliens willingly demonstrate their ability to remove Homo sapiens from this world. Will the clues found on the mysterious cone-shaped device be deciphered in time to save mankind from extinction? 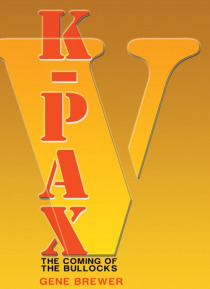 The surprise ending will captivate and reward K-PAX fans everywhere.